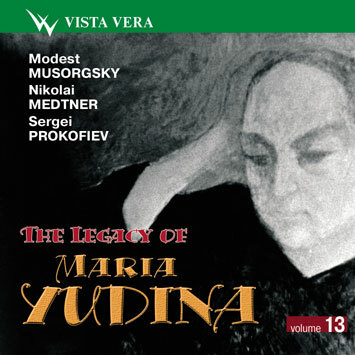 Vista Vera completed issuing of a 13-volumes series The Legacy of Maria Yudina .We would like to acknowledge gratefully all those who helped to make it possible: Vera Yudina, Maria Veniaminovna's sister, who unfortunately passed away in November, 2004; Yulia Suvorova, Maria Veniaminovna's niece; Marina Drozdova, Victor Derevianko, Anatoly Kuznetsov, friends and students of Maria Yudina; Mikhail Segelman, musucologist;Tamara Badeyan, sound engineer; Vasily Lobankov, Vladimir Dragunov, IFPI Moscow office; Victor Ossipov, Russian Society for Performers Rights Protection; Alexei Ugrinovich, National Federation of Phonographic Industry, Russia. Igor Stravinsky. Sonata C-Dur, 1924. Paul Hindemith. Sonata for two pianos, 1942 г.
Johannes Brahms Intermezzo (op.116 No 2, оp.117 No 1, 2,3, op. 118 No 1, 2, 4. 6,. op. 119 No 2, 3). Johannes Brahms. Variations and Fuga on a Theme by Handel B-Dur, op. 24. Robert Schumann. Bird as Prophet (N 7 of Forest Scenes, op. 82) g-moll. Ludwig van Beethoven. Piano Concertos № 4 & № 5. Sergei Taneyev. Quartet E-Dur for piano, violin, viola and cello, op.20. Wolfgang Amadeus Mozart. 1 Rondo a-moll, KV 511. Johann Sebastian Bach. 6 Preludes and Fugues (Well-Tempered Clavier, book 1).